Up until 2007, all of the video games in the long running Teenage Mutant Ninja Turtles franchise we’re handled by Konami, but after a failed return to form with some mediocre games based on the 2003 animated series reboot, the Japanese publisher let the rights expire to be picked up by Ubisoft. Under the direction on Konami, most of the games starring the Turtles we’re based on an animated incarnation of the group, with the exception being the DOS only Manhattan Missions which took inspiration from the first live-action film as well as the early Eastman-Laird comics. 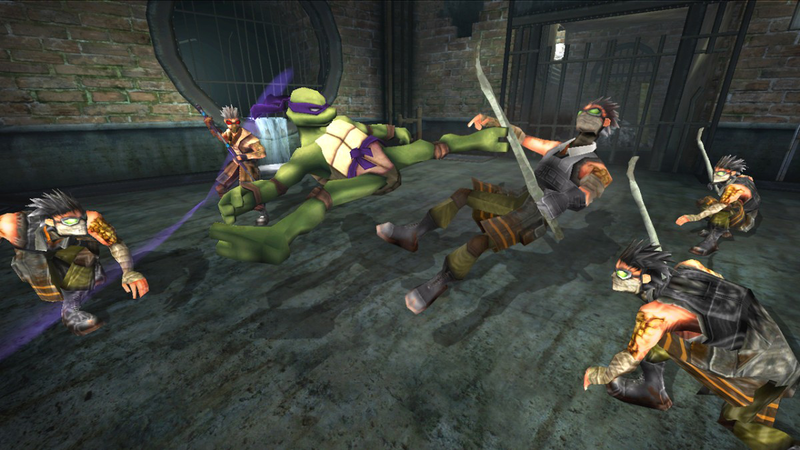 For their first effort, Ubisoft took the franchise in a different direction by releasing the first Teenage Mutant Ninja Turtles game based on a movie, 2007’s CGI animated feature TMNT. Though it takes the heroes in a half-shell in a great new direction from the Konami era and is a strong first effort from the new studio, TMNT ultimately failed to capture the magic of the 8-16 bit era glory days, however the injection of Prince of Persia acrobatics with the license is still a pretty great fit that’s worth looking into if you’re a fan of either franchise. The game based on TMNT actually takes place after the film of same name, but nonetheless recounts and expands the events of the movie by framing the story as the Turtles retelling the events of the movie to their master, Splinter. The movie didn’t have a terribly complicated plot, more or less dealing with rounding up a bunch of monsters to stop a group of feudal warlords from destroying the world, interspliced with some family drama, but if you didn’t see the movie, you may have a tiny bit of difficulty following things here. The character voiced by Sir Patrick Stewart in the film but here voiced by a soundalike, Max Winters, barely shows up at all and is a pretty important character to the plot of the film. If you’re playing this game though, chances are you’re a TMNT fan anyway and have either seen the film by now or just want to play a game featuring the Turtles. 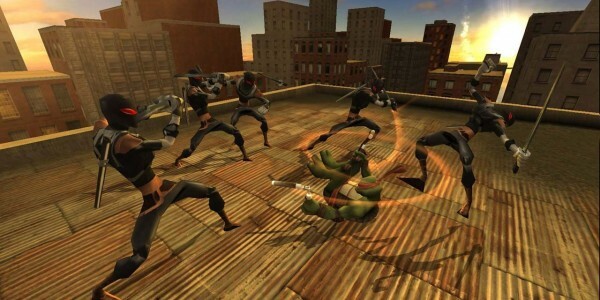 Unlike most of the major console TMNT releases, TMNT (2007) is a solo only affair which I didn’t terribly mind that much. The games from Konami inspired by the animated series from the 2000’s tried to recapture the magic of the 8-16 bit era but wound up being forgettable brawlers. Here Ubisoft Montreal, the developer of this game and the studio behind such franchises as Splinter Cell and Assassin’s Creed, focused less on combat and more on the acrobatic nature of the Turtles in what can only be described as a shameless Prince of Persia: The Sands of Time clone, and not just because the story is framed as someone telling a story like in The Sands of Time. This would normally be considered a negative in most cases, however as Ubisoft were the minds behind the Prince of Persia revival and the two are a great fit for one another. For those unfamiliar with Ubisoft’s take on PoP, first of all, shame on you, the series made a name for itself with breathtaking and tight-controlling platforming where you could do everything from run and leap off walls as well as swing off poles as you try to navigate incredibly well-designed levels littered with obstacles to get around. The majority of this game is made up of very similar mechanics, but unfortunately simplified as the game was clearly trying to market itself to the same younger audience they were shooting for with the film. In Prince of Persia you were thrown into large, semi-open rooms that were a puzzle in and of themselves that you had to try to figure out how to navigate. In TMNT (2007), all the levels funnel you down a fixed linear path where you rarely have to stop and think about where you need to go. Don’t get me wrong, it’s still fun to navigate these levels and even watch the Turtles in action, but as this is what makes up the bulk of the game, it does get tiring in extended sittings. The game isn’t very long, around five-to-six hours, but you’ll find yourself spacing that out pretty far as you set the controller down to play something with a little more depth. The Prince of Persia trilogy each had their own hook that spiced up the gameplay, such as rewinding time to reset your last jump or visiting different time periods for a unique perspective on an area, and this too carries over to this game though in a far less interesting way. 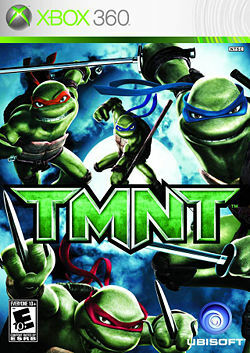 Each of the Turtles has their own special move to help them navigate the environment: Raph can climb walls tinted red; Leo can “ghost” through vents (it’s explained as him finding a magical amulet); Don can use his bo staff to clear gaps and Mikey can use his nunchucks to act as temporary helicopters. 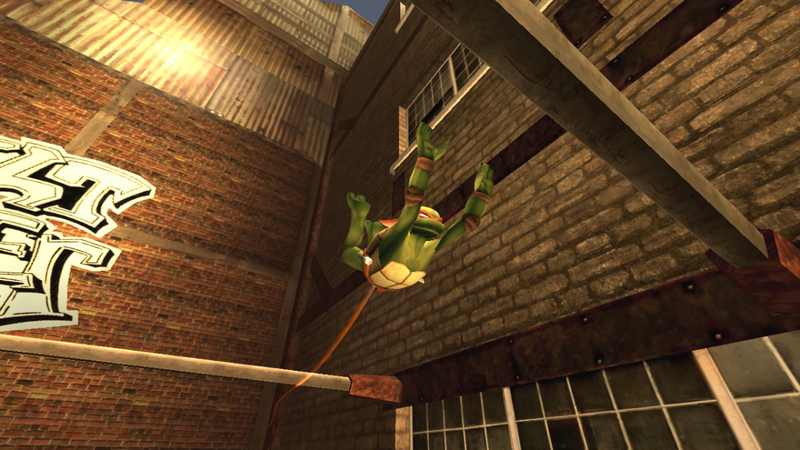 Outside of when they’re introduced, the moves aren’t really used in any clever ways to the point where you’ll sometimes even forget that your characters have them; Donatello’s ability even becomes useless once you have access to Mikey’s nunchuck float. Once you get to a certain point in the game you’re able to switch between whatever character you wish by tapping the “X” button and what the game could’ve used are scenarios where you have to combine either two, or all of the special abilities to complete a level or solve a puzzle. Instead you’ll occasionally just come to a dead-end and realize, oh wait, I can climb the wall here, I wondered why that was coloured red or, right, I can go through vents. When you’re not double jumping to platforms or jumping off of walls, you’ll be fighting Foot Soldiers and various other goons and this area of the game could’ve used the same love and attention paid to the platforming side. You can attack with your weapon or kick, but both are pointless when the game teaches you very early on that you can hold down the “B” button and charge up a move that allows you to literally watch your character attack everyone on-screen. Once you learn this, there’s absolutely no reason to even try to use either your punch or your kick when it’s so much easier and effective to go to one side of the room, charge your screen clearing attack, and let it loose. Eventually you’re given team-up maneuvers which you have to charge a meter that fills up pretty quickly that simply combat even further and is activated the same way, just by charging “X”. Mikey has a combo move with Don where you can swing him around in a circle while moving around the environment and this becomes your go to move for nearly every encounter. Where these moves can’t be exploited for maximum effort is in the few boss encounters, made up of Max Winter’s stone generals from the film. Even though you can’t use your trusty charge moves, the bosses themselves aren’t that hard or even that memorable. As this game is pretty short, it would’ve perhaps been a case where some padding in the form of some throw away villains from TMNT history, something that even the 2013 3DS game did by including bosses like the Rat King. The only time you see a character here that wasn’t in the film is a brief dream sequence boss battle with Shredder. Once you beat the very short campaign there’s not much more to do than to go play it again or play through some easily unlockable challenge rooms that are something straight out of the VR missions from Metal Gear Solid. I should use the word “challenge” in air quotes as like the campaign, they’re not very challenging at all. I played this game on Xbox 360 but this form of the game is also available on the GameCube, PlayStation 2 and Nintendo Wii. While the game is very good-looking and captures the art style of the movie very well, the 360 version adds little graphically speaking so there’s not a lot of incentive to pick up the port other than to score some easy achievements. In one casual play through I added over nine hundred points and only missed out on two achievements that I didn’t feel overly compelled to go back and try to get the rest. If you want to give this game a try, any version will do unless you only have your Xbox 360 because you sold all your other consoles. In my experience every other version of the game was also far more common to come by. If you’re of the mind that a Teenage Mutant Ninja Turtles game should only be a co-operative beat-em-up like in the good ol’ Konami days, TMNT may not be the game for you. If, however you’re like myself and grew up a Turtles fan as well as fell in love with Ubisoft’s Prince of Persia games, this game is certainly worth a look, just keep your expectations in check. The combat is overly simplified, the difficulty is low and the game is on the short side, but in spite of all those complaints, it’s still very fun to have another game that’s Prince of Persia-lite that just happens to have the TMNT license attached to it. Chances are you can get this game pretty cheap now, so if you’re like me and think the idea of a PoP/TMNT mash-up is a great idea, at least give this one play through.